Being in Koramangala for more than 4 years, one thought was continuously nagging me for a long time. It all started through one of the articles in “The Hindu”. “There is a heroic yet pathetic story about the fort. During the construction it is said that the southern gate would fall off no sooner than it was built and human sacrifice was indicated to ward off the evil spirits. A benevolent ruler like Kempe Gowda could not even dream of such monstrosity. Even though there were many mention of the above tale but there was no mention of the exact location. I tried many sources to pin point the exact location but all of no avail. After about four year of reading the above article, Answer came in a most unexpected way while inquiring in Koramangala's Anjaneya temple. A gentleman came from behind and informed that the temple I was inquiring is in Koramangala Village, on the lane besides Safal Store (Opp. Passport Office) and near to Bajaj's Popular Showroom. When i reached the spot I saw that Temple has been totally encroached upon and is literally struggling for its survival. The temple was close. During my next visit also I found the temple closed. When I tried to find about the temple timings, I was told that the temple only opens on Friday morning and that too for a short period of time. Hope I will be lucky next time to visit the temple when it is open. Good discovery Swami. Some time we feel very sad about the way we preserve our monuments but not doing anything. Your effort is really appreciated. 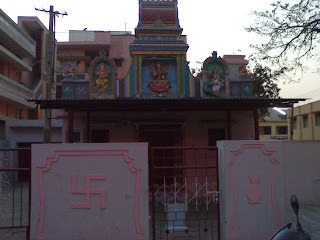 do not listen 2 swami.i kno about this temple because it is now inherited from my grandfather.the temple is not struggling 2 survive.it is open every morning.soon it will be renovated into a grand big temple by 2014. Dear varun, happy to note that temple will be renovated soon. Hope to see renovation exhibit our values in architecture. The temple might be opening in morning now but during my 5 years plus stay in Koramangala, it used to open only on Friday morning. If you notice, I wrote this post on 2009. Things might have changed after that esp after 3 years.